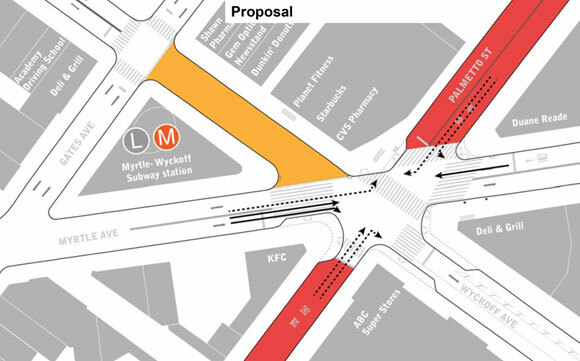 Three people have been killed by turning drivers at the crowded Myrtle-Wyckoff transit hub since 2009, and the local community board still won’t vote for a city plan to improve pedestrian safety at the complex six-legged intersection. Last Wednesday, Brooklyn Community Board 4 declined to endorse DOT’s plan to simplify the intersection and create a car-free plaza on one block of Wyckoff Avenue between Myrtle and Gates [PDF]. Since the project straddles the Brooklyn-Queens border, DOT will also seek a vote from Queens Community Board 5’s transportation committee tomorrow evening. People outnumber vehicles three-to-one at the Myrtle-Wyckoff intersection, which is located at the convergence of two subway lines and six bus routes. The current configuration leads to too many conflicts between drivers and pedestrians: Three pedestrians were killed there between 2009 and 2014. Two and a half years ago, hundreds of people gathered at the intersection to remember Ella Bandes, who was struck and killed by a bus driver in 2013, and call for safety improvements. Minor changes afterward were not enough to prevent the death of Edgar Torres, who had the right of way when he was struck and killed by a turning MTA bus driver in 2014. Making a block of Wyckoff car-free would do what previous adjustments could not: give pedestrians safe passage between the train and the Ridgewood Bus Terminal on Palmetto Street. Turning movements would be dramatically simplified, reducing potential conflicts. CB 4 District Manager Nadine Whitted could not provide a vote tally from Wednesday’s meeting but said only two board members sided in favor of the project. Whitted did not explain why the board rejected the project other than to say members did not like the “bus reroutes,” by which she was presumably referring to the B26, which currently utilizes the block of Wyckoff that would be pedestrianized. Community board votes hold no legal sway over DOT or its projects, but in practice the department often scales back or even cancels street safety projects at the behest of local community boards. Reynoso has consistently argued that DOT should not let community boards obstruct street safety projects. Queens CB 5 has been much more responsive to the pedestrian safety concerns at the intersection, Kottick and Bandes said. 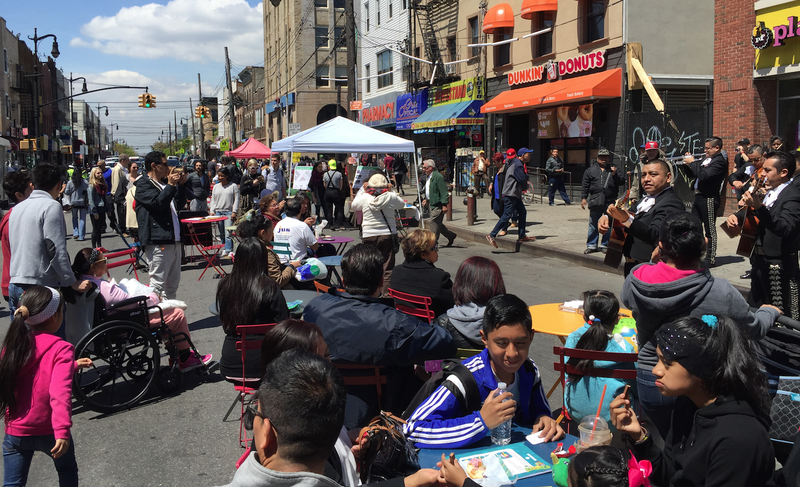 In March, CB 5 Chair Vincent Arcuri told Streetsblog that while it was not his preference to make any streets car-free, he understood that other interventions had failed to make the intersection safe. Tomorrow’s transportation committee meeting gets underway at the Queens CB 5 office, 61-23 Myrtle Avenue, at 7:30 p.m. DOT should come to these meetings with waivers, stating that by failing to endorse its safety plans, community boards are assuming any financial liability that the city should face for suits stemming from crashes at these locations. We care what CB4 has to say because…………..? Oh right. Because DOT is too spineless to do anything that a bunch of cranks on a community board might object to. Three people have been killed here since 2009. Everyone who speaks out against the project at the community board meeting should be required to point to three people in the room whose death they would be willing to accept in order to maintain the status quo. Community boards do not truly represent their communities. I recommend you all go to at least one board meeting in your neighborhood. You will find that the attendees and board-members are overwhelmingly older, white, and concerned with drivers above everyone else. In this instance, the DOT did a survey (linked to in the article) and 95% of respondents said yes to a permanent plaza. The survey also showed that only 5% of people at the location arrived by car. I hope the DOT goes ahead with this project that will save lives and improve the neighborhood. It’s clear that while the neighborhood is in favor of the project, the board only cares about their own opinions, not the opinions of residents. DOT and the Mayor’s Office have to stop being so afraid of a few old cranks on the community boards. If the board can offer some constructive input or show some legitimate reason to alter a safety plan, fine. Otherwise hear them out and move forward. They have no real power over street safety and when they talk nonsense they should be ignored. Several others in the area that are bad as well. See badintersections.com searchable database map.